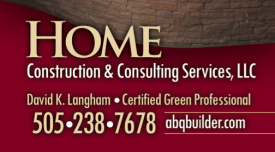 Home Construction and Consulting Services, LLC is an Award Winning Residential Contractor specializing in providing High-Quality Homes, Products and Craftsmanship to our Clients in the Greater Albuquerque Metropolitan Area and in Santa Fe. We firmly believe that each and every Project should receive the same Attention to Detail and Quality, regardless if it is a Porch Addition or construction of a new Two-Million Dollar Home. You deserve the best and it is our responsibility to take care of Your Dreams. We have won multiple Awards and been Featured in numerous Publications.